Labradors are considered to be among the breeds that are easiest to care for when it comes to grooming. Their coats do not tend to get matted and dirt usually brushes out of them quite easily. Their coat also contains natural oils that help keep it looking shiny with regular brushing. However, even a low-maintenance dog needs grooming from time to time. Grooming not only helps your Lab to look good but it also helps to maintain his health. While you are grooming your dog take the time to look over his body, paws, teeth, ears, and eyes for any abnormalities or signs of infection. Check for any scrapes, cuts, burrs, fleas, ticks, etc. over your Lab’s entire body. Check his paws for any cuts, thorns, or broken nails. Check his mouth for broken teeth or red, swollen gums. Look inside his ears and make sure they look pink and healthy. Check for any built-up wax, redness, or foul odors. Make sure his eyes are clear and healthy – not watery or red. If you notice any issues take the time to get them checked out by your vet. Grooming should be fun for your dog. It can also be a good bonding time between the two of you. Reward him with treats as you go about it so it will become something he looks forward to. Labradors do not need a lot of maintenance but your dog should be checked over for any grooming needs at least once a week. His coat will need regular brushing to help with removing excess fur, especially if you don’t want clumps of it laying all over your house. Even though your Labrador may be low-maintenance, there are still grooming supplies you might want to keep on hand. I have provided a list of some of the basic supplies below. Some of these items are only needed if you intend to take care of the grooming yourself. For example, if you plan on taking your Lab to the groomers or vet to have his nails clipped you may not need your own dog clippers. You’ll notice a few different types of brushes on this grooming supply list. This is to help care for your Lab’s upper and lower coat and all of the shedding he will go through. 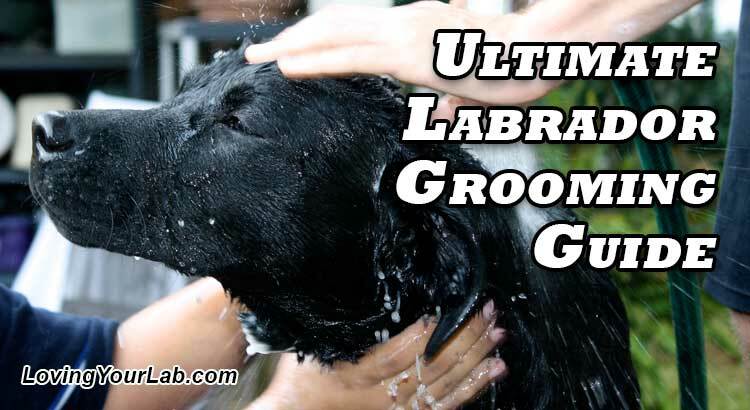 Your Labrador doesn’t require any special shampoo. If he has dandruff or flaky skin, you may want to use a medicated shampoo. It’s a good idea to use shampoos made for dogs as people shampoo cans sting your Lab’s eyes or dry out his coat. I mentioned in a previous article that we use Mane ‘n Tail Shampoo on our Lab, which leaves his coat silky and soft. It also seems to take care of his dandruff when it starts showing up. This shampoo was originally for horses (hence its name) but is now used by both dogs and people as well. You can find it in most drug and grocery stores. In choosing a toothbrush for your Lab, make sure you select a toothbrush that is made for dogs. You can also get dog toothbrushes that fit on the end of your fingertip that work fairly well. Most dogs prefer meat or peanut butter flavored toothpaste. Finding a flavor your dog likes can make it easier to train him to tolerate having his teeth brushed. DO NOT use toothpaste made for people. Your dog will swallow some of the paste which contains ingredients that can make him very ill. We go more in-depth on this topic in our article called, 19 People-Foods That Can Harm Your Dog. Instructions on how to brush your dog’s teeth will be explained a little further on. There are two kinds of nail clippers for dogs. One type is a guillotine style with a sliding blade that squeezes shut. The other is a scissor type which has two opposed cutting blades. Another option is to use a Dremel or similar grinding tool to grind the nails down. Any of these options will work well. I describe how to properly clip your dog’s nails a little later in this article. A curry comb fits into the palm of your hand and usually has either rubber or plastic teeth. These teeth help loosen the undercoat on your Lab and bring the dead hair and dirt to the surface. This is a good tool to use during those times your Lab is shedding heavily. The undercoat rake gets down into your dog’s coat and helps to remove large amounts of shedding undercoat. Shedding blades are usually double-sided and loop-shaped. The serrated blade helps to remove lots of hair quickly as you pull it across your Labrador’s coat. You may have to purchase this at a horse supply store or online. This is the brush you will probably use the most often. It is usually rectangular and has thin, wire bristles. It helps get rid of any loose hair, dirt or knots. This is a great finishing brush that helps distribute your Lab’s natural oils through his coat to keep it smooth and shiny. It is also gentle on his more tender areas, like his tummy. These will be used for trimming away extra hair especially around the ears and paw pads. You will need several towels on hand to dry your Lab after bathing him. You may also want to buy a carrier or box to keep all your supplies in so you will have them all in one place when needed. Labrador’s have a double coat to help protect them from the cold and water. Some think that because Lab’s have a double coat it must be harder to take care of and keep them clean. This is not true. Labs have natural oils in their coat that help keep it shiny and smooth. Some basic bathing and brushing will keep your dog’s coat neat and healthy. While doing research for this article I found that there were two different views on bathing your Labrador. One view asserted that Labs very rarely need to be bathed. This view claimed that the natural oils in the dog’s coat helped to keep it clean and that you only need to regularly brush your Lab. They suggested that you bath your Lab just a couple times a year or when he had gotten himself into something stinky. They also said that bathing too often dries the coat out. The other view asserted that frequent bathing (about 2-3 times a month) does not dry the coat out at all as long as harsh shampoos aren’t used. This view claimed that a gentle shampoo can help keep the coat soft and shiny. As far as I can tell, both views give some sense of the truth. Labradors’ coats do have natural oils that keep them shiny and frequent brushing seems to take out most of the dust and debris that the coat collects, and also helps to disperse the oils throughout the coat. On the other hand, more frequent bathing with a gentle shampoo also seems to help keep the coat clean and smooth. Either way, the Lab will still need plenty of brushing. For our Lab, Trooper, we choose to bath him more frequently. He tends to have dandruff and we have found that bathing him a couple times a month helps to keep that condition under control. Whichever option you subscribe to, your Lab will need bathing at some time. So what is the best method for bathing your Labrador? You may want to put a drop of mineral oil in your Lab’s eyes to protect him from the shampoo. If you choose not to do this, just be careful when washing his face and try to use a tearless shampoo. It’s a good idea to put a cotton ball in each of your dog’s ears to keep water out. If water gets into his ears and stays there, it can lead to an infection. Make sure you don’t shove the cotton balls in too far in and don’t forget to remove them after the bath. Use warm water, not hot. Hot water can dry out his skin too much. Soak your Lab’s coat thoroughly, making sure to get through the thick coat all the way down to his skin. A hand-held shower attachment can be very helpful and make bathing your dog easier. Lather up the shampoo and massage it through your dog’s fur. Make sure you massage the shampoo through both coat layers. Always use a gentle shampoo. When you are cleaning his face place a small amount of shampoo on a washcloth or on your hands and gently wash that area, being careful to avoid his eyes. You can follow up with a conditioner if you want. We always add conditioner to Trooper’s coat to help prevent dandruff. Rinse thoroughly. It should take you longer to rinse than to shampoo. Your Lab’s coat is thick and you need to make sure you get all of the shampoo out of it. Keep rinsing until the water runs clear. If you don’t get all of the shampoo out it can dry and irritate your Lab’s skin. Allow your dog to shake after his bath, then dry him off with clean towels. Dry him as thoroughly as you can, especially if you’re bathing him outside and it’s cold. You don’t usually need to blow-dry your Lab. If you choose to do so, be careful to keep the dryer on its low setting so it doesn’t burn his fur or skin. Keep in mind that your Lab’s first instinct when you are finished will be to roll around. You might want to keep him from going outside for a while after his bath so that he will roll on the clean carpet instead of in the dirt or grass. He will also probably want to rub himself against your furniture or walls. As I’ve mentioned, Labradors have a double coat. The outer coat, called guard hairs, are harsher and contain natural oils that help repel water and dirt. The undercoat is the softer, thicker hair that helps keep your Lab warm. Regular brushing (anywhere from a few times a week to daily) helps keep your Lab’s coat looking its best. Brushing helps remove the dead hair and spreads the natural oils throughout the coat. Keep in mind that even though your Labrador’s coat contains natural oils it should never look greasy. If you notice that his coat has a greasy condition take him to the vet and have it checked, as this could be the sign of an infection. You should never shave your Labrador. His coat protects him from the weather and shaving him takes away his protection and will leave him vulnerable to extreme temperatures. Also, contrary to some misconceptions, shaving him will not stop his shedding. Many dogs often enjoy being brushed as they enjoy the attention and how the brushing feels. You can always finish up your brushing routine with a treat so your Lab knows he will be rewarded at the end. Brush your Lab outside if possible. Labs shed quite a bit and it will be easier to clean up if you brush him outside. If the weather is bad you may want to brush him in the garage or some other area that is easy to sweep. Use the rubber curry to loosen up the dead hair in his undercoat. Make sure you get the curry deep into his undercoat and rub in a circular motion. If your Lab is going through a time of excessive shedding you may want to use a wire slicker brush to help bring out more of the dead hair. Brush against the growth but be gentle around the legs and belly where there is less hair. Also, during major shedding periods, you can use the undercoat rake to work on the stubborn, soft undercoat areas. Pay special attention to the fur over the shoulders as it is thicker in those areas. You may need to use your hands to spread the fur so you can get down into the softer layers. You can also use the rake along his neck and gently around his ears. Use the shedding blade and wire slicker brush to remove any loose hair. Finish up using the bristle brush. Brush in the direction of his natural hair growth, starting at his head and work your way down to the tail. Gently brush the legs and tummy. Labs are heavy shedders and there isn’t anything to do to change that. Most Labs have a heavy shedding period in the spring and late fall. However, they tend to shed somewhat all year round. The best way to deal with shedding is frequent brushing. During the heavy shedding periods, you will want to brush his coat daily. The sooner the old coat is out the sooner the new one can come in. Moreover, the more hair you brush out the less you will find around your house. If your dog seems to be shedding unnaturally he may need to see the vet. If you notice patches that aren’t growing back or if he is scratching the bald area a lot he may have a hormonal issue or be allergic to something. The vet can help diagnose the issue and help get it corrected. Your Lab’s eyes should be checked on a regular basis to make sure there are no irritations or infections. Gently stroke your Lab’s head pulling back his ears. This will naturally open the eyes wider so that you can inspect them. Normally your Lab’s eyes should be bright and clear. The white parts should not have any redness. Older dogs sometimes have a greenish tinge to the whites of their eyes. This is a normal occurrence with aging dogs. You should also check under his eyelids. Gently use your finger to pull down the lower lid and inspect it, then again for his upper lid. The tissue should be pink but not red. If your Lab has been running outside in open terrain or in an overgrown field he may get seeds or dirt trapped under his eyelids, so make sure to check them frequently if he is out in those areas. If you see redness in your Lab’s eyes this can be a sign of infection or irritation. If you think there may be something in his eye gently wash it out with a saline wash or tap water. If the redness continues or you see your Lab frequently rubbing his eye, he should see a vet. Sometimes your dog may have a little mucus or discharge (often called “gunk”) in the corners of his eyes. You can gently wipe this away with a clean, damp cloth. However, if the discharge is green or yellow and the eyes look irritated you will need to take him to a vet for medication to clear up the issue. If your Lab’s eyes ever look cloudy or have a bluish tinge over them, you need to have him checked out by a vet. This could indicate cataracts which can lead to blindness if not treated properly. Labradors have floppy ears. These ears look cute but unfortunately, they create a dark, damp area which is perfect for bacteria and fungus to grow in. To help prevent this make sure you always thoroughly dry your Lab’s ears after a bath or a swim. You should check your Lab’s ears weekly. Gently fold back the ear flap and check the outer canal for wax, dirt, burrs, ticks, or any signs of infection. You may want to use a small flashlight to see the area better. If you see redness, discharge or small black or reddish granules these can be the signs of an infection. Some other indicators of infection are a foul odor or if your Lab is constantly rubbing his ears or shaking his head. Any of these things can be symptoms of infection or ear mites. If you see any symptoms take your dog to the vet immediately. If ear infections aren’t treated they can lead to deafness. Your Lab’s ears should be cleaned once a week. If he tends to produce a lot of wax they should be cleaned more regularly. We have an article that goes into much more detail about how to properly clean your dog’s ears. You can read it here. However, I am reposting the basic cleaning instructions here for convenience. Do not use Q-tips when cleaning your dog’s ears as it is too easy to insert them too deeply and injure his ears. Your dog’s ear canal is L-shaped so you can’t clean too deeply anyway – which is helpful since you don’t want to. You only want to clean the outer area of your dog’s ears, just like you would on yourself. Put a small amount of your preferred cleaning solution on a cotton ball and start massaging your dog’s ear. Start near the ear canal but never in it. You don’t want to go too deep as this could damage your dog’s ears. Massage the solution gently into the skin allowing it to loosen dirt and wax. Your dog may want to shake his head. Go ahead and let him. This will help to loosen the debris. Repeat this process using clean cotton balls as needed and continue from the inside of the ear to the outer edges. Starting near the canal and moving away from it will pull the dirt away from the ear. If you start on the outer edges and move towards the canal you may push dirt and wax into your dog’s ears. If your dog’s ears are particularly dirty or waxy, repeat the procedure until everything is clean. Afterward, wipe down his ears with a dry cloth. Labradors need their teeth cleaned just like humans do. If their teeth aren’t cleaned they can suffer from many of the same dental issues that we have. Plaque and tartar can build up on your Lab’s teeth causing gum disease and infections. Dental disease is one of the top health problems that vets see in dogs. One way to prevent tartar build up is through your Lab’s diet. Some dogs are able to maintain clean teeth just by chewing. There are some dog foods that contain ingredients that will help keep your dog’s teeth clean. You can also give them hard vegetables like carrots to chew on or special toys that are made to help remove plaque and tartar while they chew on them. Another way to get rid of the plaque and tartar is through teeth brushing. This should be a regular part of caring for your Lab. Most Lab’s don’t really like having their teeth brushed so introduce it slowly. 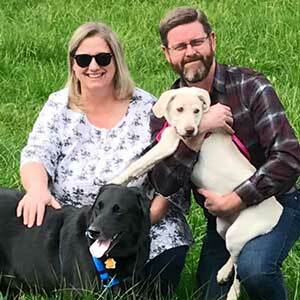 Start when your Lab is a puppy or as soon as he becomes part of your family. You can use a finger toothbrush that fits over the tip of your finger or even just a bare finger and gently massage your Lab’s gums to get him used to the process. After a few days of doing this, you can use a finger brush or dog toothbrush with dog toothpaste. Make sure you gently brush the front and back of all of your Lab’s teeth. Don’t forget to brush the back molars, as this is where a lot of food particles accumulate. If you find a toothpaste flavor that your dog likes he may be more willing to let you brush his teeth. We use a peanut butter-flavored paste. DO NOT use toothpaste made for people. It can contain harmful ingredients that can make your dog very ill. If your Lab’s gums are healthy, you can brush just once or twice a week. If he tends to have issues, then try to brush every day. Keep in mind, the more often you brush, the less likely it is that your dog will develop issues. Check your Lab’s teeth regularly and watch for any signs of infection. Check his gums. They should be a healthy, pink color without any bleeding or swelling around them. Other signs of tooth infections can be a sudden change in the odor of his breath or if he stops eating his food. Watch to see if he is pawing at his mouth a lot or if he seems sensitive to touch around his jaw area. Dental infections can cause issues throughout your Lab’s body, causing disease and even organ failure. This is why it is important to catch any dental infections early and have them treated by your vet. Dental visits are also important for your dog. Your vet will want to clean your dog’s teeth once or twice a year depending on his age and the condition of his teeth. Your vet will scale and polish your dog’s teeth while he is under anesthesia. She has special equipment and can reach the areas below the gums that we can’t get to with regular brushing. She will also check for any infections or teeth that need to be removed. If you keep your Lab’s teeth and gums clean and healthy the cleaning process at the vet will go much smoother for him. If your Labrador spends a lot of time outside, you should check his paws on a regular basis. Make sure that you check the pads of his feet for any cuts, abrasions, and embedded stones or splinters. You can use sterilized tweezers to remove anything that is embedded in his paw as long as it isn’t too deep. After that, you can use a mild antiseptic to treat any injured areas. If there are any issues try to keep your Lab from running around for a while to give his paws time to heal. It is important to check his paws as any cuts and abrasions that aren’t treated may become infected and can cause him to limp. Another issue that can cause your Labrador to limp is an insect sting. If you think that your dog has been stung apply an ice compress to the area. This will help reduce any pain and swelling. Watch your Lab for any respiration issues that could indicate an allergic reaction to the sting. If you notice that he’s having trouble breathing, get him to the vet immediately. If your dog is limping but there are no signs of cuts, abrasions or stings, you will need to have him checked by a vet. He may have sprained a muscle or even broken a bone. Sometimes objects become so deeply embedded in the foot pad that they need to be removed by a vet. If you live in areas that have a lot of snow make sure you check your Lab’s feet if he has walked in any areas where chemicals are applied to melt the snow. Some of these chemicals are harmful to your dog’s foot pads and need to be washed off quickly. Make sure you use warm, soapy water. After you wash them you can apply petroleum jelly, like Vaseline to the footpads. This will help soothe any discomfort the chemicals may have caused. If you live in an area where these chemicals are used a lot, ask your vet if there is a cream she can recommend to protect his foot pads. If these chemicals are left on your Lab’s paws they can cause a chemical burn. Sometimes your Lab will have excess hair growth in between and around the edges of his foot pads. To keep that area neat and tidy, use a pair of blunt-edged scissors. Your Lab’s nails should be kept fairly short. If the nails are allowed to get too long they can cause injuries and even affect the way your Lab walks or stands. Long nails can also scratch your wood floors or get caught in your carpet. If your Labrador gets plenty of outside exercise, especially on hard surfaces, like concrete, this will help keep his nails worn down. If he doesn’t get out as much, he will need his nails trimmed more often. Regardless, you should check his nails frequently to see if they need to be cut. If you hear his nails clicking on your floor, it is time for a trim. There are two types of clippers you can use on your Labrador’s nails. One type is scissor-like with two opposed blades. The second type is more guillotine-like and has one sliding blade. Either type works fine, just make sure they are sharp and change the blades often. One other option is to sand the nails down with a hand-held grinder. Your Lab may need to get used to the sound before you use one on him. Also, keep in mind that the grinder can get hot so you will need to stop frequently and let your dog’s nails cool down. You will also have to move slowly and carefully to make sure you don’t grind off too much. Most dogs don’t like having their nails cut. Start training your Lab early to like having his paws touched. Play with his feet and reward him when lets you hold his paws. To start, hold one paw gently but firmly in your hand. Softly squeeze his paw to help extend the nails. You will want to clip the nails at a slight angle and take just a little bit at a time until his toenail is about even with the end of his toe. Be careful when doing this. If you cut the nail too short you may cut the quick. The quick is a vein that runs down the middle of the nail. If you clip this it will hurt your dog and it can bleed. In a Yellow Labrador’s nails, the quick is often visible as a pinkish area but is harder to see in a Chocolate or Black Lab. If you do happen to cut the quick just use a tissue or cotton swab to apply pressure until it stops bleeding. When the bleeding stops you can apply styptic powder to the nail. Styptic powder is a clotting agent as well as an antiseptic. You will want to keep your dog calm for a little while after the nail clots so that the bleeding doesn’t start up again. If your Lab’s nails haven’t been trimmed in a long time then it’s possible that his quick could extend all the way to the end of the nail. If this is the case, you will need to trim a little bit back every day and give the quick time to recede. Don’t forget that your Lab’s dewclaws need to be trimmed as well. This is a toenail that is part way up the backside of his front leg. If this isn’t trimmed it can grow in a circular formation and become embedded in his leg, which can be very painful. Praise your Lab and reward him often as you trim his nails. Keep him as calm as you can through the process. If you are worried about trying this at home, you can ask your vet to show you how to do it, or you can hire a groomer or vet to do this for you. I will admit that I am afraid to trim my Lab’s nails on my own, so we always have them done professionally. When Should I Take My Dog to a Groomer? Taking care of all of your Lab’s grooming needs at home can be a lot cheaper than taking him to a groomer. However, if you prefer to let someone else take care of his grooming and you don’t mind paying for it, there is no reason not to use a groomer. Even if you take care of most of your Lab’s grooming needs you may still want to take him to a groomer during his heavy shedding periods. A groomer has special dryers that can help remove the excess undercoat. This is especially helpful if you or anyone else at home has allergies. You may also require a groomer if your Lab is sprayed by a skunk. A groomer usually has special, high-powered sprayers and odor removing shampoos that can give your Lab a deep cleaning. If you don’t want to trim your Lab’s nails yourself, this is also something you can let a professional groomer take care of. As I mentioned earlier, this is what we do. What Should I Consider Before Choosing a Groomer? All groomers have different styles and not every groomer is the best for your Lab. There are several things you should consider before choosing a groomer. Check to make sure that the shop is clean. Obviously, there will be dog hair on the floor, but watch to see if they sweep up often and wipe down the grooming tables. Watch to see if they leave dogs unattended on the grooming table. The dogs are usually tethered to the table and if they try to jump off they could hurt their necks or become strangled. Make sure your dog cannot escape the dog grooming area. There should be barriers in place that keep the dogs from getting outside of the shop. Watch how the groomers treat the dogs. Are they patient? Are they rough? Do they take him for walks or provide water if he is there for several hours? Another option to a grooming shop is a mobile groomer. These groomers come right to your house and have equipment in their vans to take care of your dog in your own driveway. Many dog owners find this option a welcome alternative to going to a noisy shop and leaving their dog there for several hours. Can My Lab’s Diet Affect How His Coat Looks? Yes, it can. If your Lab is eating a lot of low-fat foods, his coat will tend to be dry and rough. Your Lab needs fats in his diet to help his coat shine. Omega fatty acids seem to be the best. These come in two basic types the omega-3s and the omega-6s. Omega-6 fatty acids are easier to find and are usually already in your dog’s food. These are found in plant oils like sunflower oil. Omega-3 fatty acids are more expensive and harder to come by. These are found in marine fish oil and flaxseed oil. You may need to add this type to your dog’s diet. Your Lab’s system uses marine fish oil more efficiently, so that is the best one to use. Ask your vet about the best way to add these fatty acids to your Lab’s diet. Are Labradors Inside or Outside Dogs?